STAMPtember is officially here and it’s time to celebrate! I’ve said this in the past and I’ll say it over and over again – STAMPtember is my favorite time of the year in the stamping community. I love to see all the various stamp manufacturers some together and unite during the month of September at Simon Says Stamp store and blog. 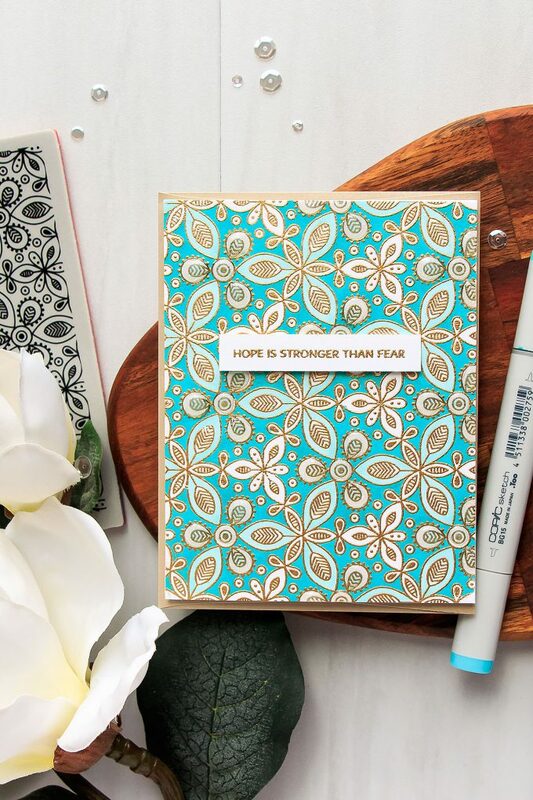 This is going to be the 4th STAMPtember for me and it’s bound to be filled with loads of creative inspiration! I know one can feel overwhelmed to see so many new products so if you are not planning to do any shopping – do stick around for numerous videos, tutorials and just plain good fun! If you are visiting my blog for the first time or have not yet subscribed – be sure to do so! I share lots of handmade projects every week delivering them straight to your inbox! I also occasionally share information about craft product sales and new product releases I love. Subscribe here. You can unsubscribe any time. 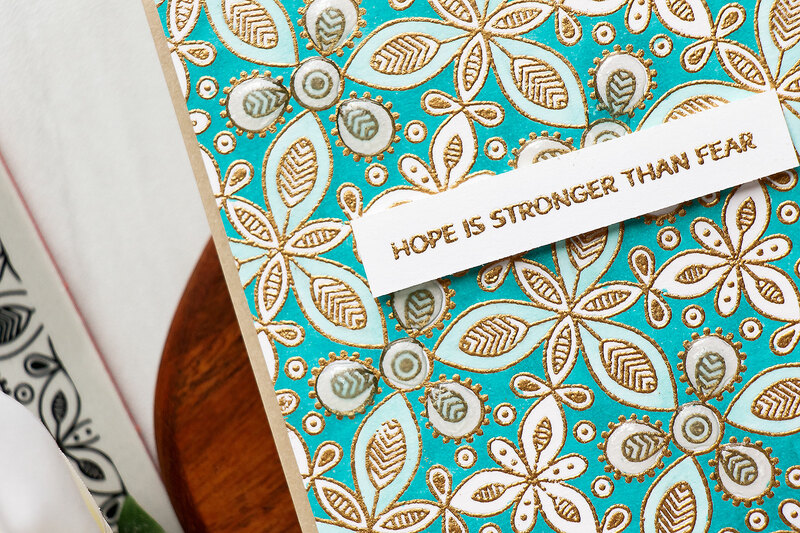 I have two cards to share with you today using new Kaleidoscope Leaves background stamp. If you’ve seen my post from yesterday and watched the video tutorial you know I mentioned I’ll be sharing more examples featuring kaleidoscope coloring. If you haven’t, here’s a link to my yesterday’s post and I’m sharing that video below, too. 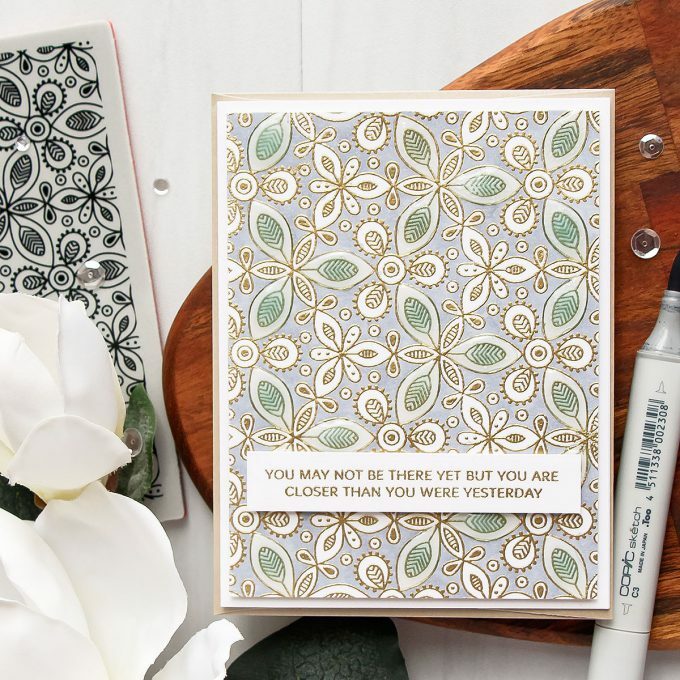 The idea behind these two cards today is very simple – heat emboss the background, color it using one or two (or more if you prefer) colors of markers and coat some of the non-colored shapes with Nuvo Glaze (or Glossy Accents). Stay tuned as I’ll be sharing more ways to color these later during the month. I started working on this card by heat embossing Kaleidoscope Leaves background in Gold embossing powder onto white cardstock. Next, I used a single C3 Copic marker and colored in a portion of the background taking care to leave some (identical) shapes free from coloring. I trimmed my background to 4 x 5 1/4″ and foam mounted onto an A2 card base. I also heat embossed a sentiment from the new You Got This stamp set in same Gold embossing powder, trimmed it into a strip and foam mounted onto my background. Finally, I used Nuvo Glaze and coated some of the white non colored shapes to create a raised dimensional effect. Here’s another card example using this technique. 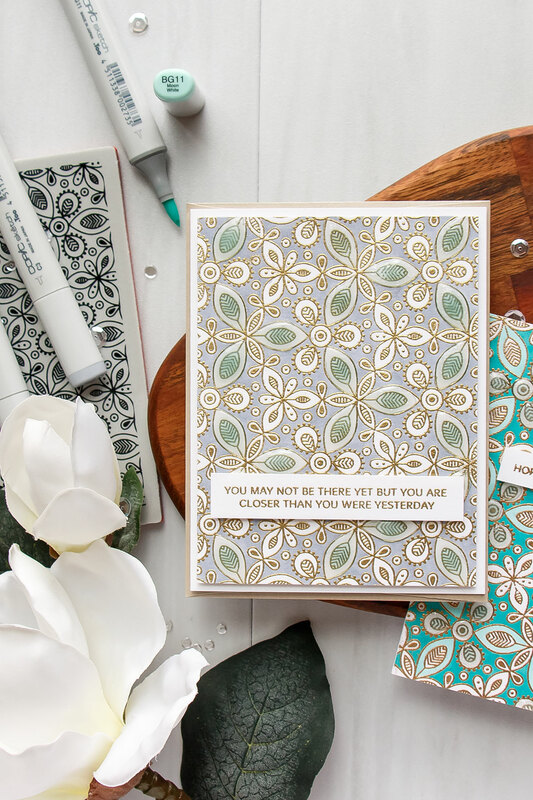 Same background stamp, but different color embossing powder – Antique Gold and 2 colors of markers this time (BG15 and BG11). 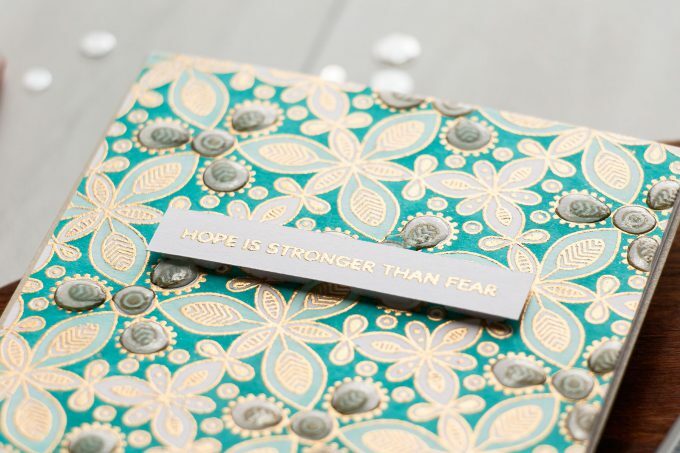 Sentiment, Hope Is Stronger Than Fear, also comes from the You Got This stamp set. Have you ever tried this look before? You don’t have to use Nuvo Glaze for this, Glossy Accents from Ranger and Dimensional Magic from Plaid also work great for this technique. Here’s a video tutorial from yesterday showing this technique with a similar, but previously released product – Kaleidoscope Background. Watch it below or on my Youtube channel. Join us for Day 1 (and come back tomorrow for Day 2) – Inspirational blog hop! The next stop on this hop is Kay Miller. You can also start over at Simon Says Stamp Blog. Simon is giving away a $50 coupon to every stop on the hop from blog comment section – this is double what they usually do for blog hops because STAMPtember® is special! Comment below for your chance to win! Winners will be chosen over the weekend and will be posted on Simon Says Stamp store blog on Tuesday. 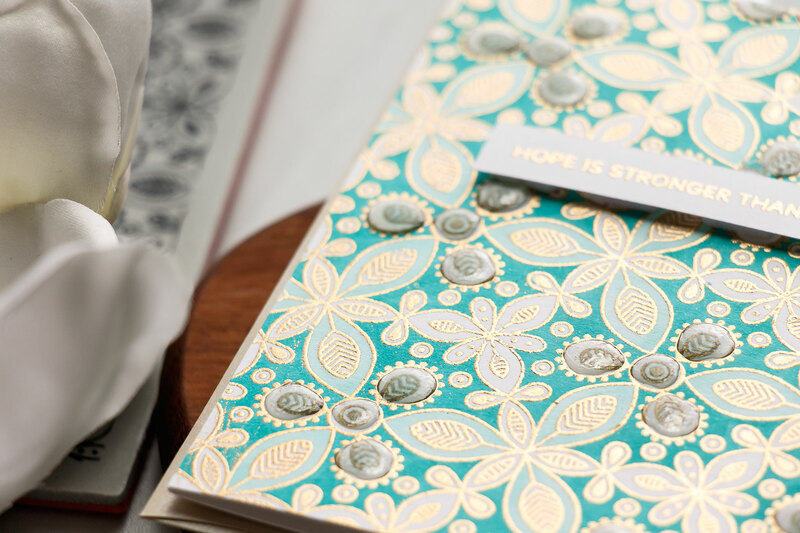 The gold embossing adds a touch of elegance. So pretty, Yana. How elegant! Beautiful works of art! These cards are gorgeous! I love the gold embossing and Nuvo glaze accents. 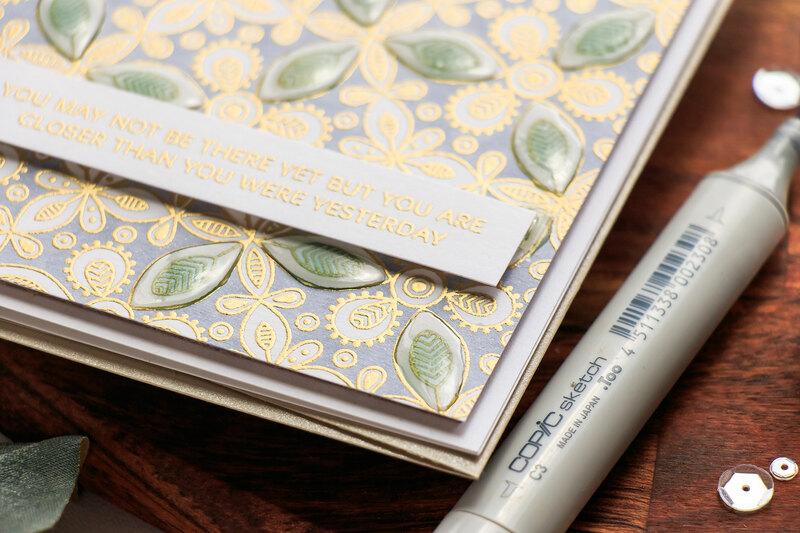 Very creative way to use a background stamp, just beautiful! Yana those cards are amazing. Love the work you do. Beautiful cards! 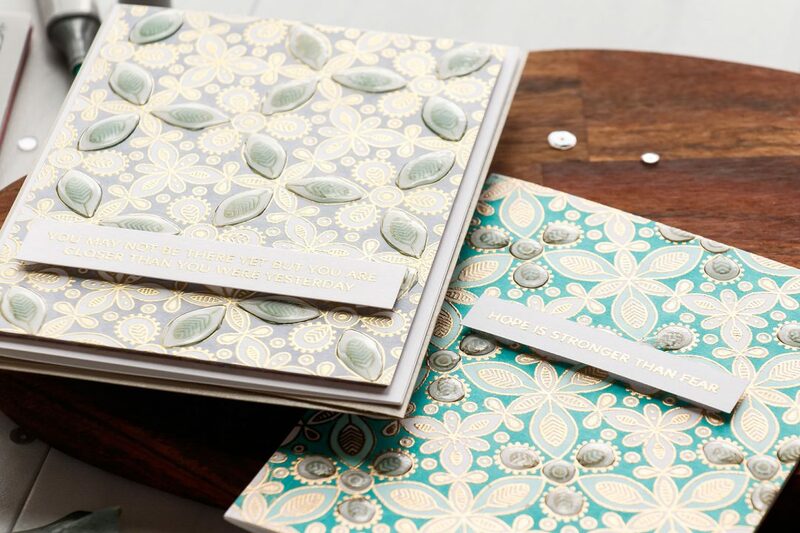 Love the gold embossing and the hints of glossy shine. Amazing card! Love the embossing. 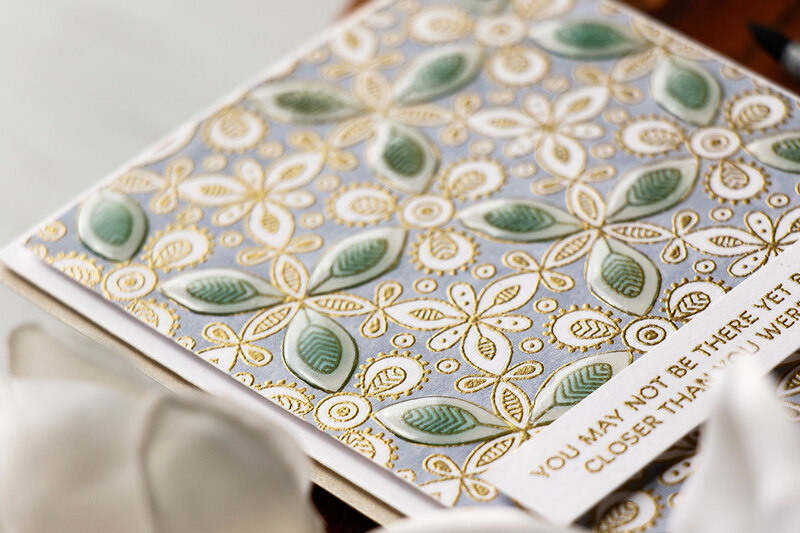 Your cards are so pretty – thank you for sharing them! Wow, these are really beautiful background stamps! Love those raised glossy accents! 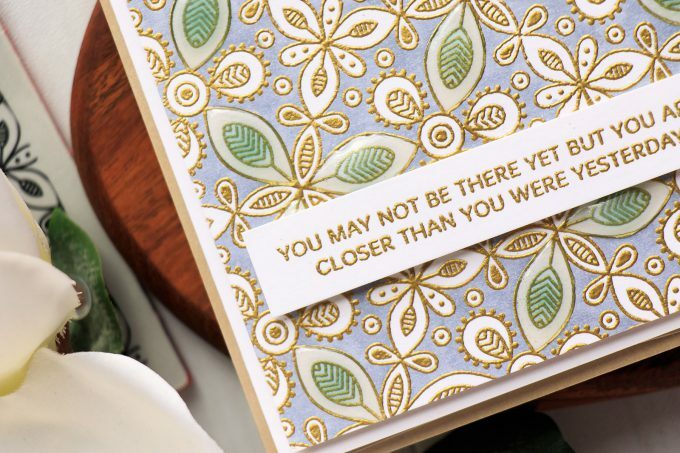 I would have passed over the Kaleidoscope Leaves background stamp if I hadn’t read your post. Love the soft coloring on the first stamp. I can definitely see this stamp in my future! Absolutely gorgeous! I would love to try this! The kaleidoscope leaves are on my must-have list! Thank you! I absolutely love the blue card. Stunning! Love this awesome card design, beautiful stamp too! SSS rocks! 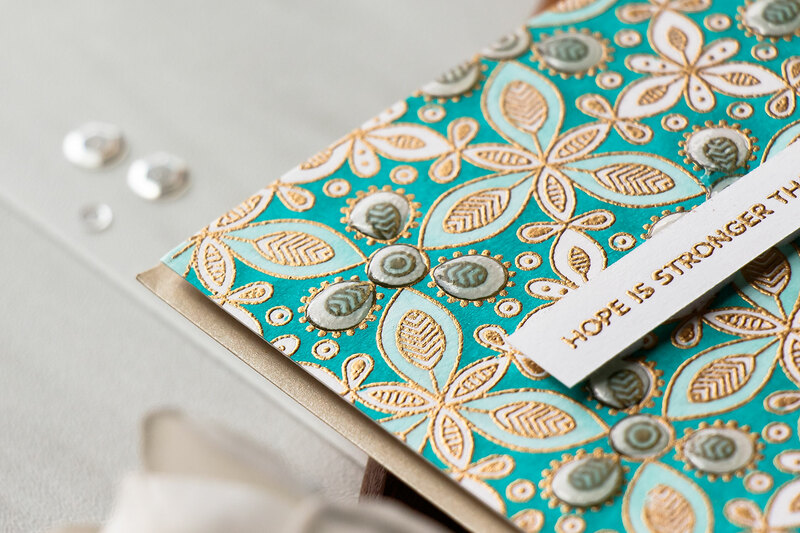 Great cards using lovely colors and just the right amount of additional design work.